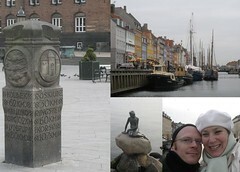 S took me to København for my birthday last year. We saw the famous Little Mermaid statue, walked to the top of the Round Tower, and had an all-around good time. I also fell further in love with Scandinavian design. Unfortunately - or fortunately for my wallet? - the shops were closed on Sunday, so all my Saturday window shopping and planning was for naught.